A Pacific Northwest National Laboratory researcher is developing approaches to spread the work evenly over scads of processors in a high-performance computer and to keep calculations clicking even as part of the machine has a hiccup. 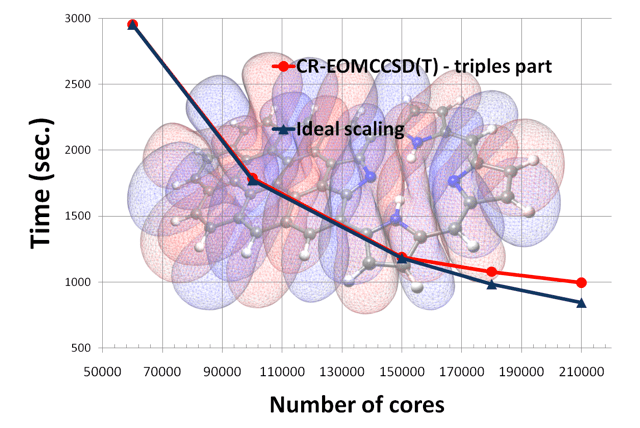 Scalability (red line) of the triples part of the re-normalized EOMCCSD(T) approach in excited-state calculations for porphyrin-coronene complex. Timings were determined from calculations on the Jaguar Cray XT5 computer system. The cost of failure can be steep, nowhere more so than in high-performance computing. Broken node electronics, software bugs, insufficient hardware resources, communication faults – they are the bane of the computational scientist. They also are inevitable. Addressing fault tolerance and efficient use of distributed computing has become urgent as the number of computing nodes in the largest systems has increased. Using a technique called selective recovery, Sriram Krishnamoorthy of Pacific Northwest National Laboratory and his computational science colleagues have demonstrated that petascale computing – and eventually exascale – will depend on a dramatic shift in fault tolerance. “The basic idea of dynamic load balancing is you can react to things like faults online,” Krishnamoorthy says. “When a fault happens, we showed you could actually find what went bad due to the fault, recover that portion and only that portion and then re-execute it” while everything else continues to execute. Typically, when high-performance computing systems fail, the process rolls back to the last checkpoint, a record of the calculation’s state, then re-executes the failed task across all nodes. That method works well, but consumes a lot of time and space on the system. With the new method, described last year at the International Supercomputing meeting, when there is a failure, only the faulty process is rerun, while the computer continues without interruption. The method relies on a system of checks that ignores duplications and synchronizes results in a given task. It also keeps tabs on the overall job through data structures that are globally accessible, rather than stored in local memory, thereby reducing communication. Krishnamoorthy began his work improving the efficiency of algorithms as a graduate student at Ohio State University. When he joined PNNL in 2008, he found a collaborator in Karol Kowalski, a computational chemist working to model the behavior of organic molecules that can shift their electronic state to harvest energy from light. Later the molecules can release that energy to generate electricity. Currently, solar panels use inorganic arrays to perform the same function, but organic photovoltaics may be more flexible if they can be made efficiently. To guide a would-be builder to an organic molecular system that efficiently transforms solar energy into electricity, Kowalski models the behavior of electrons within these molecules at various excited states. But the computational power required to model even a simple system with a few electrons quickly becomes prohibitive when using standard methods. Krishnamoorthy quickly went to work to determine how to adapt Kowalski’s models for efficiency and to run the algorithms on much larger parallel systems. DEIXIS: Computational Science at the National Labs is the frequently updated online companion to the eponymous annual publication of the Computational Science Graduate Fellowship. The Krell Institute manages the program for the U.S. Department of Energy. Enter your name and e-mail address below to receive email notifications when DEIXIS posts news on computational science at the national laboratories. We never share our mailing lists.